I actually nipped to the shop with just a cardi on this morning, well not just a cardi because that would be insane, but no coat anyhow! I'm getting that lovely feeling you get when you can smell that spring is on it's way but not quite. The mornings are brighter which makes it easier to get up and the nights are longer which means no nasty walking home in the dark! Love it! I love this vintage inspired charm bracelet. 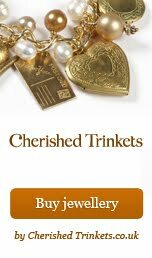 I have delicately selected individual charms that compliment each other perfectly achieving a classy vintage feel. 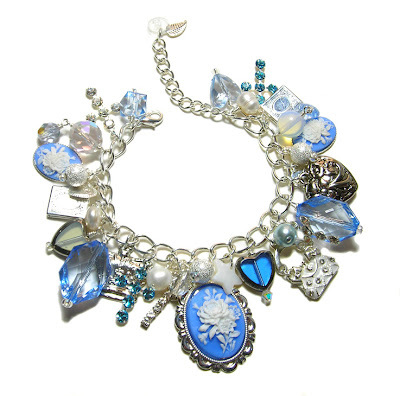 The bracelet encompasses beautiful cameo flower charms in a gorgeous shade of blue and cream, delicate Swarovski crystals encased in a cross, fresh water pearls, Iolite beads and various other selected beads strung on a thick (high quality) silver plated chain. I love your designs so much. This one is so Wedgewood. You know I was really toying with the idea of calling it that. I'm in two minds whether to change it's name!